If the "church" in America wants God to bless it...perhaps it should stop cursing the people of America by telling them God is okay with their sin. God will never bless a curse...especially when it's done in His name. 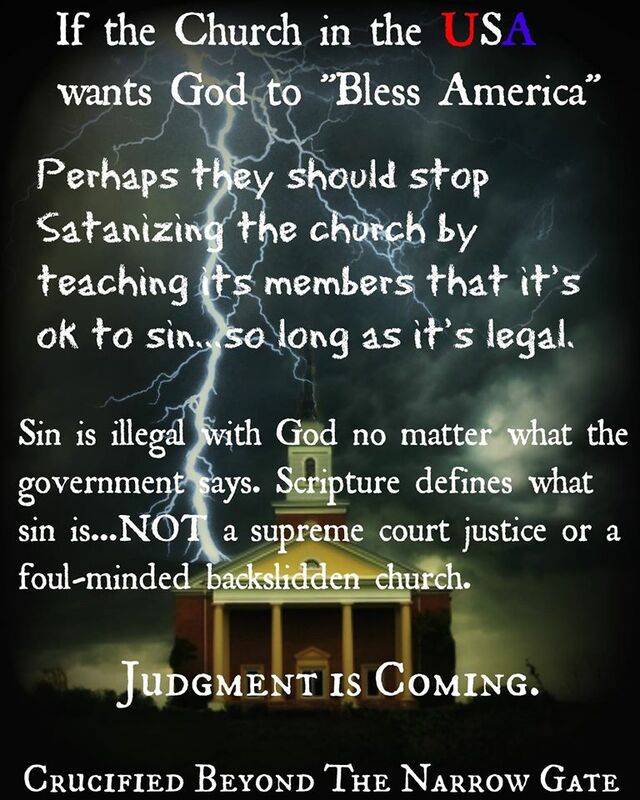 If the "church" wants God to bless America...they need to stop making it appear that it's God who is legalizing sin. If He is going to say "depart from me, I never knew you" to the lawless ones (Matthew 7:23)...how much more so in regard to those who make HIM appear to be lawless...JUST. LIKE. THEM? (self-idolatry: to fashion and form God into your image). May a quaking baptism in the fear of God grip this nation by the throat and cast it at the feet of the One they've profaned. Get your affairs in order before your creator: the brimstone is coming. Judgment is coming. First to the true and false "House God"...then to presidents, politicians, Supreme Court Justices and EVERYONE in-between. So they could live with themselves and be able to look in the mirror without vomitting...they have paid off the conviction of their conscience by making God appear to be JUST LIKE THEM. Those who have projected themselves on God as being just as sick, twisted and sinful as THEM...will soon be judged; not only according to the sins THEY have committed...but also according to the sins THEY have made it appear God has committed. God cannot transgress His own Word (people can only make it look like He does). A sinfully wicked self-idolater ALWAYS makes God a condoner of their favorite sin. Which in turn, makes God appear to be a transgressor of His Word. The church of: "God is okay with my sin" is about to be destroyed...by the very God it has plagiarized and grossly misrepresented. America's greatest opposition isn't opposing political parties...America's greatest threat isn't terrorism...it's God. And bitter repentance is the only thing that'll save them.